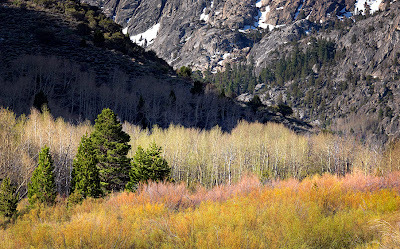 It has been a long winter here in the Sierra Nevada. Parts of the Southern Sierra are starting to thaw out and show some spring foliage. 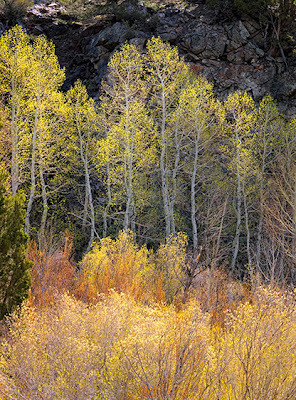 I did a quick trip down to Bishop to photograph the wild Iris blossoms, but arrived a few days too late to get the best blossoms. 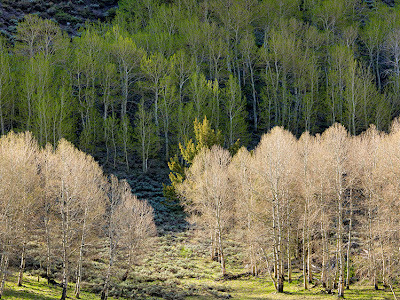 Fortunately on my way back I drove the June Lake loop just north of Mammoth, and lo and behold came upon some wonderfully lit spring Aspen trees. In the early spring the light leaves of the Aspens have a wonderful glow similar to what you would find in Autumn, but a little more subtle. I was able to get some nice shots of these Aspens illuminated in the morning sun. I added these images to the High Sierra Photographs portfolio on my website.